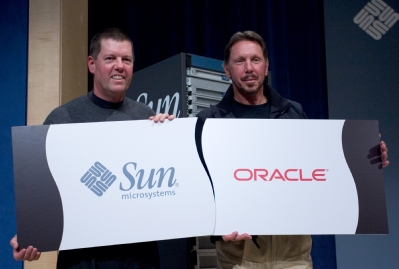 Oracle Corporation (NASDAQ: ORCL) and Sun Microsystems (NASDAQ: JAVA) announced today they have entered into a definitive agreement under which Oracle will acquire Sun common stock for $9.50 per share in cash. The transaction is valued at approximately $7.4 billion, or $5.6 billion net of Sun’s cash and debt. “We expect this acquisition to be accretive to Oracle’s earnings by at least 15 cents on a non-GAAP basis in the first full year after closing. We estimate that the acquired business will contribute over $1.5 billion to Oracle’s non-GAAP operating profit in the first year, increasing to over $2 billion in the second year. This would make the Sun acquisition more profitable in per share contribution in the first year than we had planned for the acquisitions of BEA, PeopleSoft and Siebel combined,” said Oracle President Safra Catz. Sun Microsystems, Inc. (NASDAQ: JAVA) develops the technologies that power the global marketplace. Guided by a singular vision -- "The Network is the Computer" -- Sun drives network participation through shared innovation, community development and open source leadership. Sun can be found in more than 100 countries and on the Web at http://www.sun.com. which either company does business, and the possibility that Oracle or Sun may be adversely affected by other economic, business, and/or competitive factors. Accordingly, no assurances can be given that any of the events anticipated by the forward-looking statements will transpire or occur, or if any of them do so, what impact they will have on the results of operations or financial condition of Oracle or Sun. In addition, please refer to the documents that Oracle and Sun, respectively, file with the Securities and Exchange Commission (the “SEC”) on Forms 10-K, 10-Q and 8-K. These filings identify and address other important factors that could cause Oracle's and Sun's respective financial and operational results to differ materially from those contained in the forward-looking statements set forth in this document. You are cautioned to not place undue reliance on forward-looking statements, which speak only as of the date of this report. Neither Oracle nor Sun is under any duty to update any of the information in this release. In connection with the proposed merger, Sun will file a proxy statement with the SEC. Additionally, Sun and Oracle will file other relevant materials in connection with the proposed acquisition of Sun by Oracle pursuant to the terms of an Agreement and Plan of Merger by and among Oracle, Soda Acquisition Corporation, a wholly-owned subsidiary of Oracle, and Sun. The materials to be filed by Sun with the SEC may be obtained free of charge at the SEC's web site at www.sec.gov. Investors and security holders of Sun are urged to read the proxy statement and the other relevant materials when they become available before making any voting or investment decision with respect to the proposed merger because they will contain important information about the merger and the parties to the merger. Oracle, Sun and their respective directors, executive officers and other members of its management and employees, under SEC rules, may be deemed to be participants in the solicitation of proxies of Sun stockholders in connection with the proposed merger. Investors and security holders may obtain more detailed information regarding the names, affiliations and interests of certain of Oracle's executive officers and directors in the solicitation by reading the proxy statement and other relevant materials filed with the SEC when they become available. Information concerning the interests of Sun's participants in the solicitation, which may, in some cases, be different than those of Sun's stockholders generally, is set forth in the materials filed with the SEC on Form 10-K and will be set forth in the proxy statement relating to the merger when it becomes available.